According to Navigant Research, global microgrid capacity is anticipated to go from 1.4 GW in 2015 to 7.6 GW in 2024—over 500% growth in a 10 year span. But, what is driving this growth? The answer: project by project, the increasing realization of the value proposition that microgrids can offer. The value of microgrids varies across different geographies, electricity markets, and regulatory policies the world over. However, there are common classifications of value streams that result upon the creation of a microgrid, including those that result from: reliability and power quality, resilience, economy, power system, and the environment. The National Electrical Manufacturers Association (NEMA) Microgrid Primer details these value streams and depicts them as follows in the figure below. 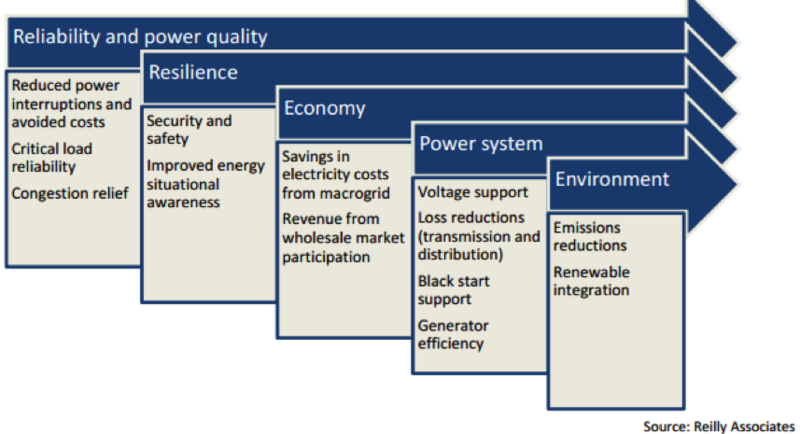 These value streams are an interplay between the customer, the utility, and society at large, and prior to development of PEER certification, there was no agreed-upon way to uniformly measure and report the attributes and abilities of a microgrid. Now, PEER allows electricity leaders, professionals, and operators to define key performance metrics, benchmark their project to industry standards, and verify measureable outcomes The result is a comprehensive set of criteria which can be explored in depth and used to justify investment.